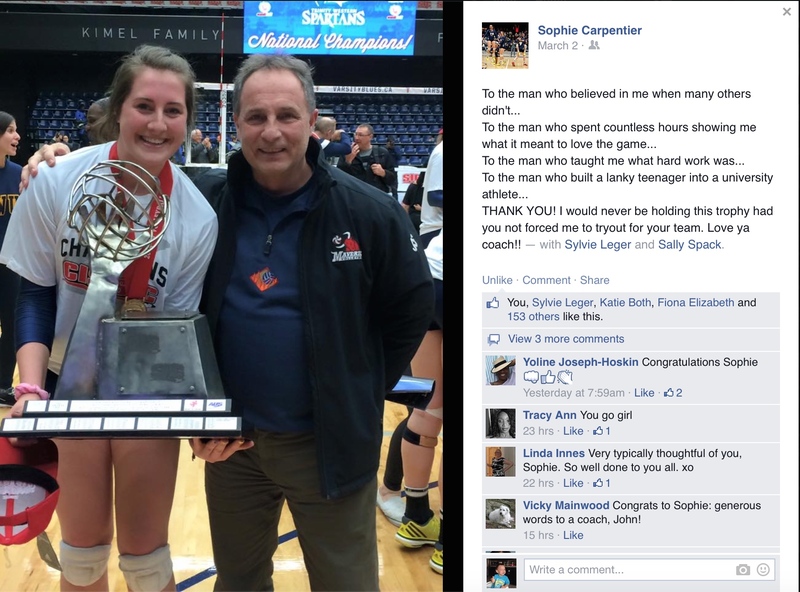 Sophie Carpentier (Mavs'12), who has represented Ontario on numerous occasions leading up to the Canada Games in 2013 and she has also worn Team Canada's colours representing our country at the U23 NORCECA Championships, won the 2015 CIS Women's Championship with Trinity Western University this past weekend. She made Maverick Club history by being the first female alumni to win a CIS medal in 2013 (bronze) she topped that by winning gold this year. She along with her Trinity team mates made Trinity history as well winning the school's first CIS Championship in women's volleyball. Sophie has accomplished a lot in her career to date and undoubtedly will accomplish much more. A very thoughtful gesture from a very kind person. What is special is that in all the frenzy that comes with winning she immediately took the time to remember her roots and recognize her Club coach from 15U to 18U, John Spack. John is not one to ever seek or ask for any type of recognition as he simply goes about his work with athletes in the background and for the past two seasons has coached two teams quietly and to no fanfare. What is truly unique about our Club and alumni is that they all feel the same pride in their Club and appreciation for their coaches they just do not have the opportunity to thank them publicly like Sophie does and Jérémie Lortie did when he won CIS in 2013. I am certain Sophie speaks for all Maverick alumni in their appreciation of the Club and the many coaches that helped them along the way.